All roles require a good amount of physicality. Good mobility, agility and capacity for “dragging a body” with assistance may be required. All will be required to participate in stage combat training that will be provided, as well as adhere to set combat choreography. Safety of all involved is our utmost concern. Classy, clever, devious, dashing, polished, jaded, witty, wry, erudite, and distinguished. Has a strong magnetizing presence of a man who has achieved great fame and stature. Once a celebrated playwright on the Broadway scene, his recent flops and concurrent writer’s block have embattled him into a man now defined by a savage hunger for a new hit play and a seeming willingness to go as far as murder for such a play. Driven not only for his renewed professional status, but, also, to regain his reputation, secure his fortune, and to win the passion of a younger playwright. A sense of humor is a must for this actor, but the part is also a dramatic challenge as it requires an ability to play consistently altering tactics to keep his crimes a secret (from other characters AND from the audience). Modest, emotional, nervous, quick, at times naïve and, rich…very rich. Filled with sunshine, and a thin but equally dark streak. A match to Sidney, she is sophisticated and upper class. She is incredibly supportive of Sidney’s career and altering moods. Sweet, caring, emotional, nervous, even skittish, she suffers from a heart condition. She married Sidney eleven years earlier, just as his reputation was declining and his string of flops was beginning to grow. She is now his primary financial support. She did not get what she bargained for, but hides it well. A mannerly, good‐looking young man who is star‐struck by the famous, older playwright, and eagerly intent on making a name for himself with a successful thriller of his own. A member of Sidney’s writing seminar, he seems honored to collaborate with him on a thriller. Murder doesn’t appear to be on his agenda, but like Sidney, Clifford is driven and has more up his sleeve than meets the eye. Eccentric, mysterious, sensitive, strong, confident, loves surprising others and herself. Professional & personal long‐time‐friend to Sidney. A blend of New England decorum and obscene vice. By day an upright lawyer, by night he makes dirty phone calls in a fake voice. Cunningly clever & comically twisted, Deathtrap is a pulse-pounding thriller with deviously wicked characters ready to assassinate you with laughter! Thrilling twists and razor‐sharp wit combine in one of the funniest murder mysteries of all time. A once successful Broadway playwright struggles to overcome a dry spell in the wake of a string of flops. His fortunes turn when a student shares a brilliant new script with blockbuster potential. Resolved to resurrect his collapsing career, the playwright conceives a treacherous trap to snare the script and take credit for its creation; much to the bewilderment of his devoted wife. 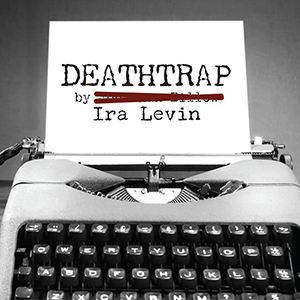 Written by the author of "Rosemary’s Baby," "Veronica’s Room," "The Stepford Wives" and "No Time for Sergeants," Ira Levin’s "Deathtrap" holds the record for the longest‐running comedy thriller on Broadway. "Deathtrap" is an exquisite blend of mystery, thrills and humor.